Solar PV (pho­to­voltaic) roof­ing sys­tems are widely known for their abil­ity to gen­er­ate elec­tric power for res­i­den­tial homes and com­mer­cial build­ings through the absorp­tion of solar energy from the sun’s rays. And, in the move­ment toward increased sus­tain­abil­ity, cleaner energy and lower util­ity bills, they are becom­ing a more com­mon sight, espe­cially in regions of the coun­try where sun­light is the strongest. Cer­tain­Teed Cor­po­ra­tion is pow­er­ing a new gen­er­a­tion of green, sus­tain­able energy solu­tions with the intro­duc­tion of the Ener­Gen™ Pho­to­voltaic Solar Power Roof­ing Sys­tem. Unlike other PV roof­ing sys­tems on the mar­ket, Ener­Gen is specif­i­cally designed with build­ing pro­fes­sion­als and con­ven­tional roof­ing con­trac­tors in mind offer­ing ease of instal­la­tion and vastly improved aes­thet­ics for homeowners. The Ener­Gen PV roof­ing sys­tem fea­tures inte­grated UNI-SOLAR® thin-film lam­i­nates that seam­lessly inte­grate with tra­di­tional asphalt roof­ing shin­gles. The system’s light­weight design requires no rooftop pen­e­tra­tions, mak­ing it eas­ier for con­trac­tors to install while main­tain­ing roof deck integrity. The lam­i­nates lie flush with the remain­der of the tra­di­tional roof­ing shin­gles, pro­vid­ing a stream­lined, visu­ally appeal­ing appear­ance. By pro­vid­ing a more aes­thet­i­cally pleas­ing, unob­tru­sive roof plane with no roof pen­e­tra­tions, the prod­uct over­comes the largest objec­tion to the accep­tance of pho­to­voltaic roof­ing panels. Across the nation, PV roof­ing sys­tems are prov­ing them­selves as an excel­lent method of increas­ing the over­all energy effi­ciency of homes and build­ings and pro­duc­ing clean energy. The growth of clean energy helps decrease our depen­dency on tra­di­tional power sources, such as coal, which have a more neg­a­tive impact on the envi­ron­ment. 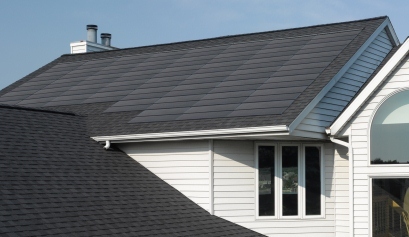 As new tech­nol­ogy devel­ops that makes PV roofs more effi­cient and eas­ier to install, we can expect increased pres­ence on homes and build­ings, help­ing us make another move toward a more sus­tain­able future.